I believe it was a couple years ago that I interviewed Erik Mona and asked him about his thoughts on Dreamscarred Press' Ultimate Psionics. He was actually really excited about it, and told me that he was glad someone had done the psionics and power point system such justice, because Paizo had different plans. With an almost childish glee in his eyes, Erik described to me his dream of a book with classes and mechanics informed by Lovecraftian mythos and new age spiritualism, with a healthy dose of 19th century mysticism for good measure. Time passed. Paizo released its Advanced Class Guide, a book so poorly edited and sublimely uninspired that I had almost given up hope that we'd see anything as amazing and awesome as the Alchemist, Oracle, or Witch from the Advanced Player's Guide, the first book where they really came out and said "We're Paizo, and this is what we're about". But where the Advanced Class Guide was a barely redeemable slog of mostly uninspired and largely formulaic class design with very few bright spots, Occult Adventures immediately leaps off the shelf as something special, something that shows that spark of creativity and healthy dose of love from the writers and contributors that is hard to quantify or explain but which is immediately recognizable in their work, and which was very much Paizo's hallmark when the Pathfinder Core Rulebook first came on the scene. When I talked with Erik Mona this year at PAX, there was really nothing I could say to him beyond "Well done, man. You guys knocked this one out of the park". The Kineticist: This is your classic elementalist, with mechanics clearly inspired by 3.5 D&D's Warlock. You have 5 elements to choose from starting out, either aether, air, earth, fire, or water. Your chosen element will determine the basic characteristics of your primary attack form, the kinetic blast, and most of your ancillary abilities. At 7th level you gain the ability to either hyper-specialize in your chosen element, or gain access to a secondary element. In practice, playing the Kineticist is actually very simple. You have your "simple blast" which is an at will ranged attack where you shoot your chosen element at the enemy. Later you'll receive "composite blasts" which are essentially upgraded versions of your simple blast that incorporate either your secondary element or give you new facility with your primary element if you chose to specialize. Rounding the Kineticist out are Wild Talents, which are divided into a small list of Defense Wild Talents, and a very expansive list of Infusion Wild Talents. The Defense talents are gained at 2nd level and are entirely determined by the element you chose to focus on. Essentially, you get a barrier or form of the same element type that either whirls around you protectively, surrounds you in a protective layer of flame that sears anyone who strikes you, or something similar. Infusions are your main opportunity to customize your character, choosing new ways to use your kinetic blast that may include launching yourself through the air with blasts of flame, creating a giant ball of earth and bowling your enemies over with it, wreathing the battlefield in a fog of ice that slows and chills your opponents, or something similar. The Kineticist is very much the psychic analogue to the Fighter - easy to pick up and play, but relatively limited in scope and power. The Medium: Another 3.5 inspired class, the Medium has some distinct similarities to the 3.5 Binder, where you essentially channel an outside entity into your body to borrow its power and skills. The Medium holds a ritual called a "Seance" to invite a spirit to inhabit his form, and then gains abilities based on the chosen spirit. For example, you could channel the spirit of the Archmage to gain improved spellcasting abilities, the spirit of the Champion to become a superior melee combatant, or the spirit of the Heirophant to become a potent healer. The spirit abilities of the Medium are shored up by a variety of thematic abilities and a fairly solid 4 level spellcasting list. This is a really great class for that player who can never quite make up their mind about how they want to fit into the party, as it gives them a high degree of flexibility and the option to be a skillful rogueish character one day, an indestructible tank the next, and then wrap up the week as the party healer. The class is surprisingly effective at filling any of its available roles, something that's a little unusual in a "jack of all trades" chassis, but which I very much enjoy. The Mesmerist: So, this class flew entirely under my radar when Paizo was running their playtest. It was this kind of not-very-great remake of the 3.5 Beguiler, and it just fell flat. I can't really explain what happened between then and the final release, but I can tell you that whatever it was, it was awesome. The Mesmerist is probably my favorite class in the book, combining an at-will debuff called Hypnotic Stare with a very high facility at feinting and a slew of cool abilities and rider effects. The Mesmerist has 6 level spellcasting with an excellent selection of spells to choose from, 6+Int skills with a skill list that's probably second only to the Rogue in its scope, and in addition to the various abilities tied to its Hypnotic Stare, it has "Tricks" it can use to plant magical effects inside itself or an ally that can be triggered to grant benefits like an illusionary flanking partner, a shadow double that takes some of the damage you might have taken and redirects it to another target, and more. Add in the Touch Treatment ability which allows the Mesmerist to cure a variety of negative mental status effects, and you have a potent and well-rounded character who is both an excellent adventurer in his own right and a fantastic contributor to any group. The Occultist: Where the Mesmerist really seemed to undergo an incredible transformation between the close of the playtest and the final release, the Occultist just.... didn't. This was my favorite class in playtest, but ti definitely had some flaws that I was hoping would get ironed out. Unfortunately, most of them didn't, so we're left with a class that is solid and interesting, but struggles to successfully fill roles other than skill monkey. It seems like it can be an effective blaster, a powerful battlefield controller, or even a deadly warrior in its own right, but unfortunately, many of its abilities simply don't scale well enough to stay relevant for any length of time. In fact, some abilities that desperately needed buffing during the playtest got nerfed by the final release! The Occultist is a 3/4 BAB, 6 level spellcasting, INT based class with 4+Int skill points and the potential for a fairly reasonable spell list. I say "potential" because of how the Occultist gains access to his spells. The Occultist gains a variety of "Implements" that serve two purposes: the first, is that they can be invested with "Focus" and grant a variety of supernatural abilities depending on the school of magic the Focus is associated with and the amount of class resource you dedicate to unlocking additional abilities. The second, is that the implements serve as "keys" to the Occultist's spell list. An Occultist who uses a Necromancy implement gains access to Necromancy spells, one who uses an Abjuration implement gets Abjuration spells, etc. The number of types of implements you can use expands as you level up. Ultimately, for me, the Occultist just lacks the flexibility and power to be interesting, and instead ends up being more of a "magical Rogue" who uses magical relics instead of sneak attacking. The class is great at being a scout or trap-finder, reasonable at being a party buffer, and just kind of falls flat elsewhere after the first few levels. There are going to be people who absolutely love this class and the way it lets them play a kind of Miskatonic archaeologist, but it doesn't make it onto my personal favorites list. The Psychic: I actually don't have a lot to say here. It's a 9th level spellcaster with a cool list of psychic spells, a "Phrenic Pool" that can be used to apply various "Phrenic Amplifications" that modify its spells as they're cast, and who gains a variety of psychic disciplines that are reliant on a secondary ability score (either Wisdom or Charisma in addition to the Psychic's core spellcasting attribute of Intelligence) and help modify and personalize the Psychic similarly to domains or arcane schools, but better fleshed out. It's a solid class that plays fairly similarly to a Wizard or Sorcerer, but with a more distinct flavor and some new mechanics. The Spiritualist: So, the Spiritualist takes one of the more divisive classes, the Summoner, and reimagines it as a psychic character with a personal spirit. The Spiritualist is a 6 level CHA reliant spellcaster who gets a very solid spell list, a variety of supernatural abilities, and a protective spirit called a Phantom. The Spiritualist's spell list includes a decent (though not comprehensive) list of healing spells, allowing them to step up into the healer role with some degree of success. If you're familiar with the Summoner, the phantom is essentially a powered down eidolon with a few unique psychic twists and abilities to it. Where the eidolon is customized via evolutions, the phantom gains an emotional focus, the driving force that keeps it tethered to the Spiritualist and the world of the living. As an example, a phantom's emotional focus could be Despair (perhaps its the soul of one of the Spiritualist's loved ones who committed suicide and was unable to move on? ), and the phantom would gain a variety of abilities keyed around that theme, such as attacks that weaken an enemy's ability to fight back and an Aura of Despair. One of the things that really surprised me about the book was the quality and quantity of the archetypes. 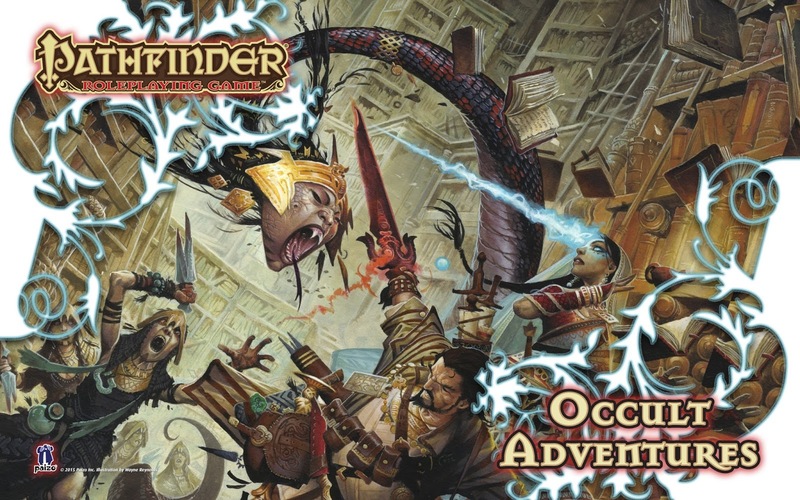 The mechanical quality of many of Paizo's archetypes seems to fluctuate quite a bit even within the same book, with the majority of their archetypes ending up in the "flavorful but not particularly spectacular" pile, with the occasional amazing archetype like the Zen Archer monk or Vanguard slayer. The archetypes in Occult Adventures are consistently awesome. I struggle to find any I don't like, and in quite a few cases, like the Vexing Daredevil mesmerist or the Necroccultist occultist, I actually like them significantly more than the base class. There is a huge wealth of material in the archetypes section, covering all of the Paizo classes. In addition to the Vexing Daredevil and Necroccultist I already mentioned, some other stand-outs are the Ghost Rider cavalier (the name pretty much covers it, you ride a ghost), the Sensate fighter (who sacrifices heavy armor proficiency but gets an improved skill list, replaces Bravery with a Guarded Senses ability that protects against a variety of sensory based effects, trades Armor Training for Uncanny Dodge, Improved Uncanny, Dodge, and Evasion, trades Armor Mastery for at-will blindsense and true seeing, trades Weapon Training for a Centered Senses ability that provides a bonus to attack and damage rolls of any weapon the Sensate wields and boosts their Will save, and trades Weapon Mastery for Precision, which allows the Sensate to roll twice and take the better result when confirming a critical hit and forces enemies to roll twice and take the lower result when confirming a critical hit against the Sensate), and the Mindblade magus (who can form weapons out of psychic energy and even create two weapons in that manner and still use Spell Combat). This is a great book. It feel like these are the classes and magic that Golarion was always meant to have, and it feels like Paizo's entire collective heart and soul was poured into making this thing awesome. The fluff and flavor are top notch, the mechanics are excellent, and everything about this book is a reminder of what the team at Paizo are truly capable of.